This year, we traveled from our Toronto office to bustling Vancouver for the 2018 TractionForce conference. With a focus on best-practice tech and thought leadership for organizations of every size and scale, it was a fantastic opportunity to connect with some inspiring teams and people. TractionForce is an annual event that hosts game-changing speakers and sparks deep conversations around non-profits, technology and marketing. 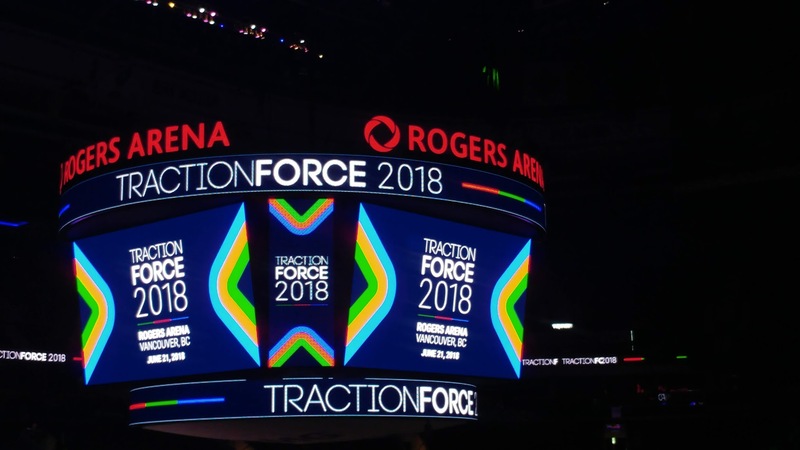 Presented and organised by Traction on Demand, the conference attracted nearly 1,300 visitors to Rogers Arena, Vancouver. Check out some footage from the conference here. The host of the event—Traction on Demand—is North America’s leading Salesforce consultant and implementer. They are a group of independent innovators committed to capacity-building within organizations and, like August, a fellow BCorp-certified organization in Canada. A key difference in Traction on Demand’s business is a genuine focus on non-profit organizations and giving back in real, tangible ways. Among other meaningful initiatives, the team has gifted a monumental $1,000,000 to non-profits as part of their Traction For Good (T4G) program. With over 350 employees across Canada, North America, and beyond, Traction on Demand continues to grow their reputation as leaders in solution design within the Salesforce and cloud application space. Back to the event itself. One highlight—in addition to the actual conference—was our time at the invitation-only Executive Summit, with representatives from Traction on Demand and an array of participating organisations. Together, we embarked on a deep-dive between founders, CEOs, and other industry leaders for an eye-opening, humbling, and super valuable 24 hours. It was an equally intense and inspiring 24 hours, with nearly non-stop discussions, sessions, dinner, and conversations lasting deep into the night. Recapping the Executive Summit + Leadership Day. We started the day over coffee (of course), and entered a bright, light-filled room for an intimate round table session between Traction on Demand CEO Greg Malpass and Traction Guest CTO Cameron Wiebe—an internal leader who helped create and launch the organization’s first ‘stand-alone’ product, Traction Guest. We had the opportunity to try the product, designed to streamline the guestbook sign-in process for offices, conferences, and events. It certainly delivers on its promise: making sign-in simple for both attendees and administrators. It was a worthwhile journey to share—even if the insights can’t necessarily be broadcast via blogpost—made fascinating by their honesty on internal product development. The pair were open about their desire to do something epic, and equally ready to discuss some of the ways they could better manage team expectations and distractions from the day-to-day business while trying to achieve their project goals. The next session was a Leaders Roundtable. In small groups, we got together and shared ideas on what ‘Digital Transformation’ means (to both our organizations and our customers)—and wow, did we get a wide, illuminating, and varied response! We discussed common challenges faced in leadership, such as how we more effectively test new ideas and better empower teams through autonomy. Data and analytics configuration were hot topics, with many participants sharing insights into configuring analytics across various platforms for more robust attribution. Attribution was a key focus for all organizations. Image courtesy of siY, LLC © 2018. Trailblazing in the age of intelligent marketing. Transforming customer service and empowering the mobile workforce. Driving efficiency and converting customers to advocates with Salesforce. Building a connected company with data governance and integration. Nonprofit Cloud: making an impact with Salesforce Analytics. 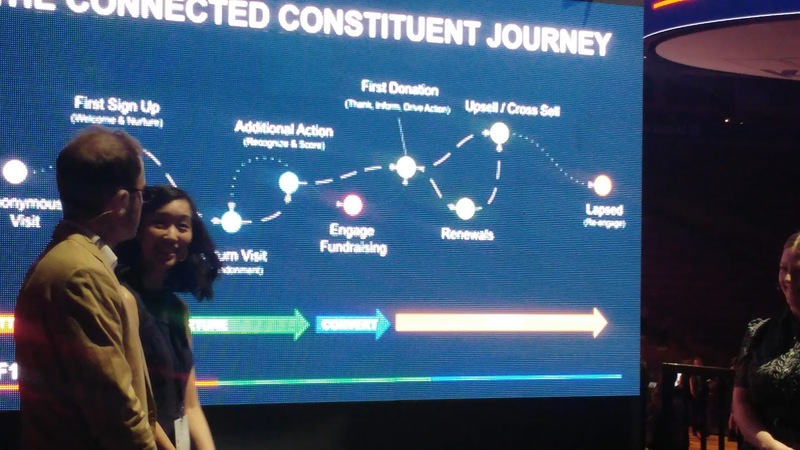 Nonprofit Cloud: building a connected constituent journey. These breakout sessions were all conducted concurrently in the main section of Rogers Arena by giving visitors the power to tune into the session of their choice using a unique system: attendees used headphones to select a session and plug in remotely. The format meant that the Arena (soon to host a Beyonce and Jay-Z concert!) was quiet for one-on-one conversations, while the main action occurred on multiple stages around the grounds—an awesome conference idea. Although the conference caters largely to non-profits, the insights in these sessions weren’t solely limited to the non-profit sector. Rather, the conversations resonated with any organization looking to influence customers on the journey to conversion, and then retain those customers as part of a community. Customer journey mapping in action. Thinking of AI technology like a taco. We also heard from several Salesforce leads specialising in analytics and data. Collectively, they offered some fascinating thoughts on the best way to conceptualize and categorize AI, including machine learning, deep learning and natural language processing. So, how are these collective technologies like a taco? Or, Taco Bell to be specific. The analogy refers to the idea that Taco Bell uses a mix of around six ingredients to create over 30 distinctive menu items. Using a similar approach can help clarify the complex rubric that is ‘AI’. The idea of mixing and matching different tools helps make sense of technology that is often complicated and easily misunderstood—especially when managing client expectations of the process involved in integrating AI into an organization. Or in articulating what the technology can realistically achieve. For example, an AI solution could be built from components including a voice-activated skill, a chatbot, and an algorithm, or any other combination of similar technologies. It’s how you combine these ‘ingredients’ to create an appealing or appropriate solution that is the key. Be clear about what you want to achieve before you decide on the technology. Just slapping AI onto a problem won’t solve it, we learnt about ways to tackle problems and to treat AI as a tool, rather than a solution. The power of advocacy in sales. Another valuable session came via Salesforce, with a presentation of some new sales benchmark research. The information provided great insight into lead-to-deal conversion rates, as well as a breakdown of channels and their yield of effective results. It’s increasingly essential that your business (and your client’s business!) 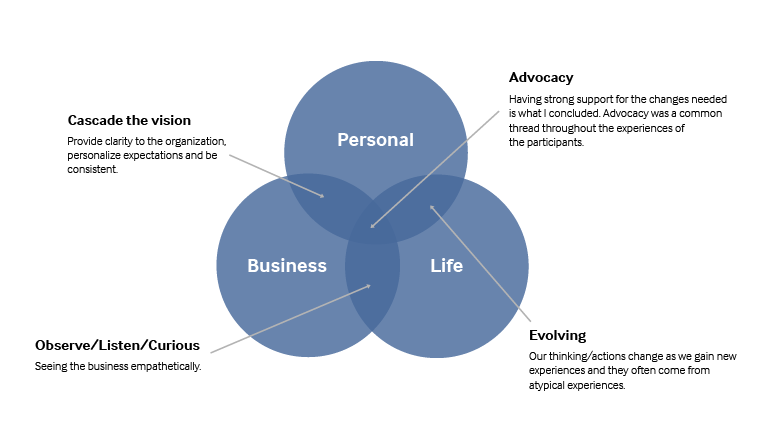 considers how to best engage people across multiple touchpoints. Start by looking into what works for your sector, audience, and outcomes, before defining what activity is targeted for conversion. 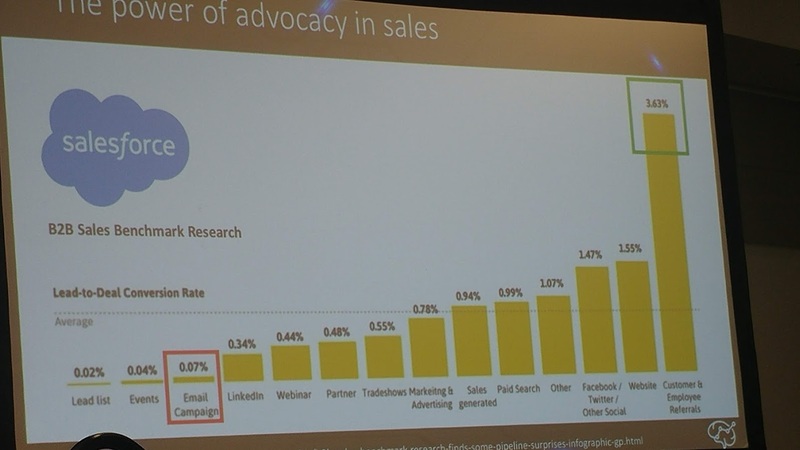 The power of advocacy in sales: touchpoints and conversion. These touchpoints all exist within the same ecosystem and consist of the different ways clients can engage with an organization. The power of advocacy was indicated in the high lead-to-deal conversion due to customer and employee referrals—demonstrating the importance of strong company culture and consistent customer service when it comes to growing your sales pipeline, not just multiple touchpoints. Super disruptors and the digital era. The pace of evolution and transformation in the digital age is invigorating, but it can also be intimidating. This is particularly true when you start to consider significant questions like what comes after digital? What technologies should we focus on next? How can we remain at the forefront of a constantly expanding and increasingly complicated industry landscape? Several speakers touched on a consistent theme. For many of the presenters, we’ve reached a tipping point regarding the technology we use each day and take for granted. Consider this fascinating concept: our current capability is analogous to being on the eve of the industrial revolution in 1897. What an exciting time to be alive! To prepare for and manage this new era, various speakers encouraged us not to focus on buzzwords like Artificial Intelligence or Disruption, and instead to champion the knowable factors of organisational objectives, clarity in approach, and user behavior. While the channels may be changing, sound strategy and quality implementation that better caters for people are key. A very special final day was capped off with a scenic flight over and around Vancouver’s beautiful waterfront and city skyline. While soaring around Vancouver Harbour and the surrounding mountains, it was a time to reflect and marinate on all the interesting experiences from my time at TractionForce 2018. It also sparked an exciting idea that I hope to share more on soon…watch this space! Couldn’t make it to the event? Session recordings of all the best conversations are available on the Traction on Demand site. Or, try using Twitter’s advanced search for 21 June 2018 to check out the hashtag #TF18 for more insights and capture from the conference. Got any ideas about artificial intelligence, tacos or just keen to chat about your idea and make it happen? Get in touch with Zoë. 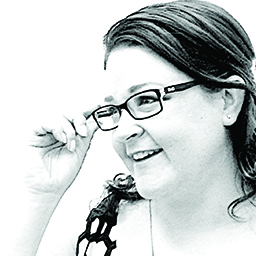 Zoë thinks, creates and delivers in pixels for August's clients. A fast-moving, quick-thinking creative with a deep communications background, Zoë melds business nous with her philanthropic heart. In both worlds, she loves nothing more than engineering an organisation's online presence to create meaningful touch points and conversations with its audiences.